Native American Style Beaded Deerskin Belt Bag | Lost River Trading Co. Native American Style hand-laced soft deerskin Belt Bag (7×10″ plus fringe) has Latigo Belt Straps, Bone Buttons and Beadwork. 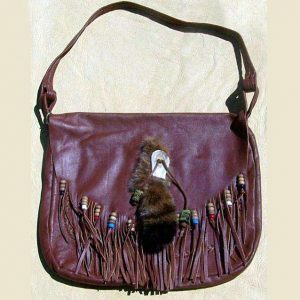 Native American Bags and pouches were made in various styles and sizes and were adorned according to tribal custom and personal choice. Bags were tied to belts, hung over the shoulder, and used for storage. Bags and pouches held such things as tobacco, spiritual items, medicine, food, and the like.